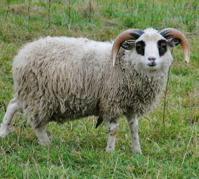 Gray yuglet flecket twin ram (brother of Flada, above). His fleece is a kindly type with high to moderate crimp, but very long, very silky! (AFD = 27.1) Must carry moorit from his sire. Wide, wide horns! 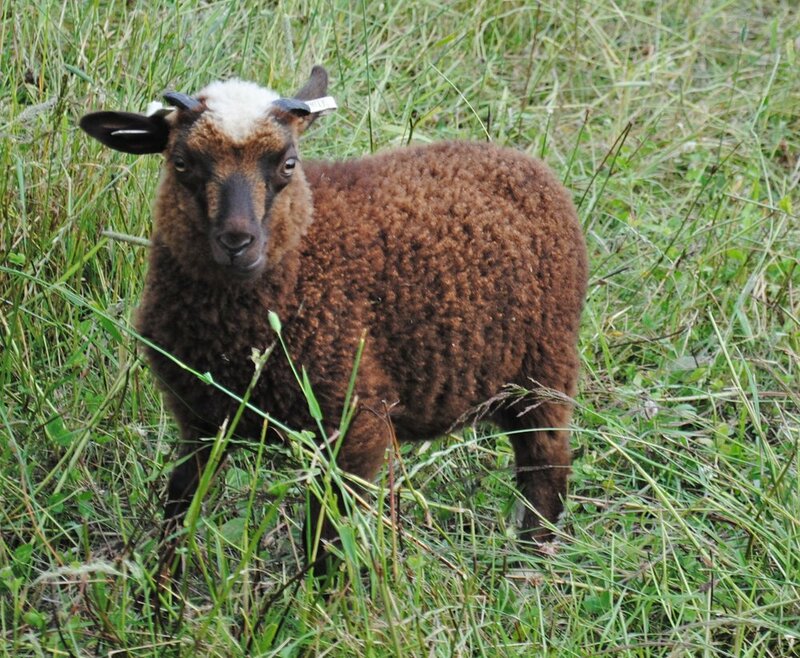 Oiseval is a moorit flecket twin ram. He is almost a caped flecket – like a caped flecket with a white cap. He has a terrific soft kindly fleece (AFD = 24.9), and really wide horns. A gray blettet sponget single ram. Fleece is very fine, with a good crimp. May carry moorit and the modifier from his sire. Nice wide horns. Sire is Bellwether Lewis; dam is Bellwether Mousa. Gray blettet sponget ram twin, brother of Sneck (below). His fleece will be intermediate in length with a good crimp. His fleece will mature to a pewter gray. May must moorit ans spotting from his sire. Nice wide horns. Sire is Bellwether Oiseval; dam is Twin Springs Foula. A black yuglet flecket single ram who must carry moorit. A big boy with a gorgeous intermediate fleece! A katmoget caped flecket twin ram who must carry moorit. His pattern was quite frankly a puzzle – he has the katmoget markings, but his cape seems to be lightening to a gray…Then I remembered that the shoulders of a katmoget are gray! Ninian is a gray katmoget, with a very soft English-type fleece with nice crimp. He is the full sib to Foula, who also has a spectacular fleece. He also shares Foula’s wonderful personality. Ninian is our farm mascot. 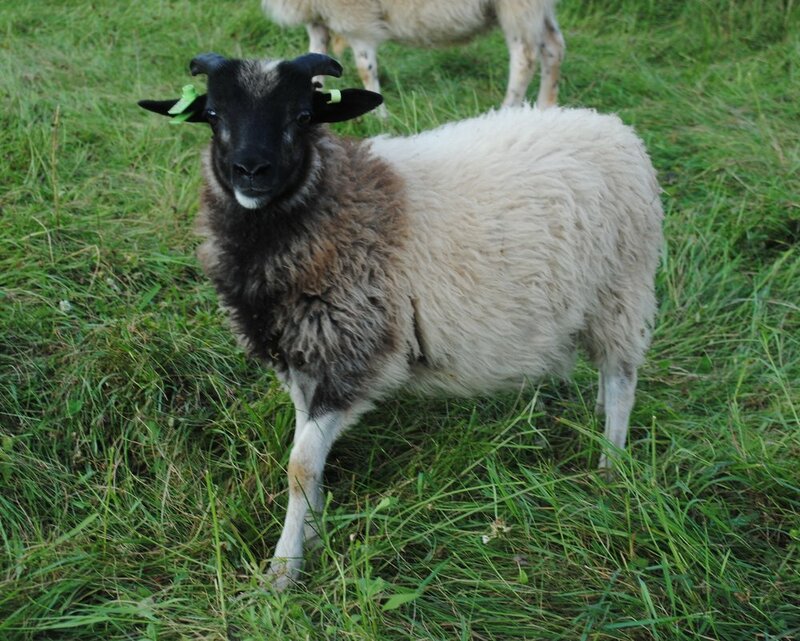 A moorit caped flecket twin wether. Excited to get this pattern, and in a moorit! Under his sun-bleached tips, the fleece is a warm brown on the kindly side of intermediate, with a nice crimp. Sire is Windswept Boron; dam is Twin Springs Hirta. A gray blettet flecket twin wether. His mature fleece is a lovely dark pewter gray, wavy and very soft. Sire is Twin Springs Forvik; Dam is Twin Springs Hirta. A moorit krunet sokket wether. Fleece is a nice dark chocolate, very crimpy and soft. Sire is Bellwether Fludir; dam is Twin Springs Hirta. Boron is a big moorit ram with flecket/smirslet/socket markings. His fleece is on the English side of intermediate, and has a nice crimp, and is very soft. Boron is a very friendly, and extremely well-mannered boy. You can see the wonderfully flashy spotting in his progeny ! Lewis is a black sponget ram twin. He is a striking guy with wide horns, and a masked “Zorro” face. Fleece has matured to a pewter gray, long and wavy. He leaves behind a terrific ram at Trinity Farm, and many other lambs who, like him, have departed for other pastures. Sire is Twin Springs Forvik; dam is Twin Springs Bernera.